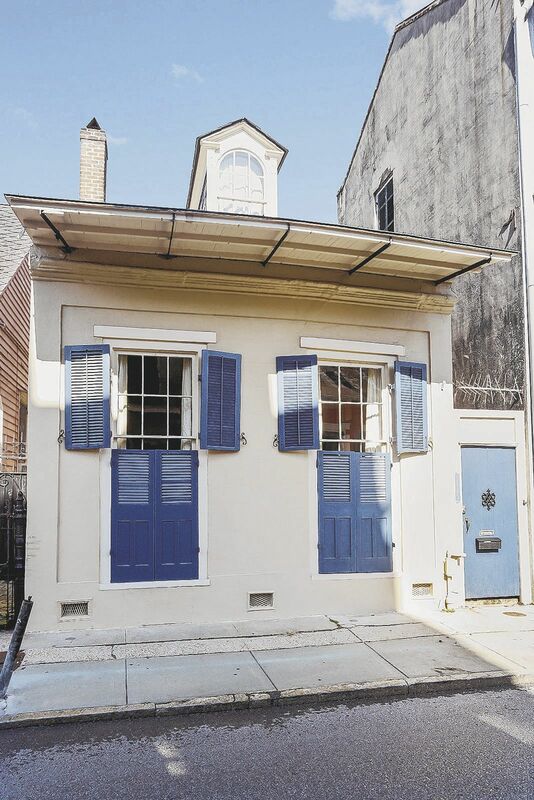 This listing is a rare opportunity to own a fabulous house in the French Quarter, with its own restored carriage house suitable for housing company and family or maybe for revenue. The entrance leads to a magnificent stair opening into a large double parlor with floor-to-ceiling windows, polished floors and a chandelier. The attractive feature of buying an older house in an established neighborhood that has been renovated is that the plumbing, wiring and appliances have all be updated. “It has a gourmet kitchen with marble countertops, an antique crystal empire chandelier and high end stainless appliances,” said DePanicis. As if 2,700 square feet is not enough space for a French Quarter house, there is also a large court yard that can be used as an extra room – and it’s perfect for entertaining. “The magnificent brick courtyard has a salt water pool and lush landscaping,” said DePanicis. The French Quarter, also known as the Vieux Carré, is the oldest neighborhood in the city. It was founded in 1718 by Jean-Baptiste Le Moyne de Bienville, and the city developed around the Vieux Carré ("Old Square" in English), a central square. Most of the present-day historic buildings were constructed during the late 18th century, during the city's period of Spanish rule, and reflect Spanish colonial architecture. The district as a whole has been designated as a National Historic Landmark. The Great New Orleans Fire (1788) and another great fire in 1794 destroyed most of the Quarter's old French colonial architecture, leaving the colony's new Spanish overlords to rebuild it according to more modern tastes. Their strict new fire codes mandated that all structures be physically adjacent and close to the curb to create a firewall. Even before the Civil War, French Creoles had become a minority in the French Quarter. In the late 19th century, the Quarter became a less fashionable part of town, and many immigrants settled here. In 1917, the closure of the Storyville red light district sent much of the vice formerly concentrated there back into the French Quarter. This, combined with the French Opera House’s burning, provided an end to the era of French Creole culture in the Quarter. Many of the remaining French Creoles moved to the University area. In the early 20th century, the Quarter's cheap rents and air of decay attracted a bohemian artistic community, a trend which became pronounced in the 1920s. Many of these new inhabitants were active in the first preservation efforts in the Quarter, which began around that time. As a result, the Vieux Carré Commission (VCC) was established in 1925. Although initially only an advisory body, a 1936 referendum to amend the Louisiana constitution afforded it a measure of regulatory power. It began to exercise more power in the 1940s to preserve and protect the district. Meanwhile, World War II brought thousands of servicemen and war workers to New Orleans and many paid visits to the Vieux Carre. Although nightlife was lively on Bourbon Street in the two decades following the closure of Storyville, the war produced a larger, more permanent presence of exotic, risqué, and often raucous entertainment on what became the city's most famous strip. More of the neighborhood was developed to support tourism, important to the city's economy, including restaurants, hotels and tourist-oriented commercial properties.